The new Bio-Dynamic product line is designed for fast weeding in vineyards and orchards with working speed up to 12 km/h. 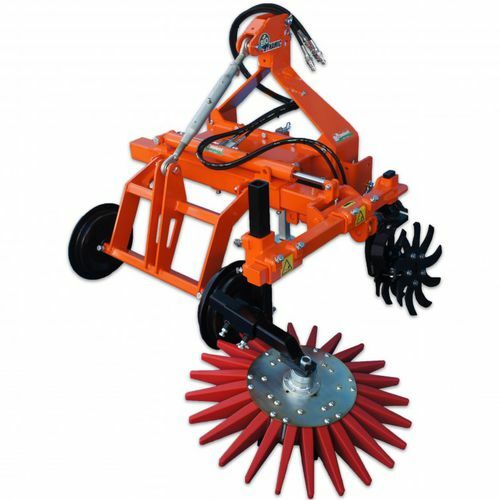 The Bio-Dynamic products have two characteristic features: The Bio-Disc tills the soil and moves it towards the plants, the fingers of the Bio-Star work the soil between the plants. The Bio-Disc group for vineyards has two discs, the version for orchards can have 3 or 4 discs. The Bio-Star is available in three different sizes (540, 700 or 950 mm diameter) and in three different consistencies: soft, medium or hard. In the standard single version of the Bio-Dynamic, the working tools can be tilted manually, the hydraulic tilting mode is optional. In the double version, manual and hydraulic inclination are optional. Manufacturers of agricultural machinery for the work of vineyards.